Learn how to make a zesty distillation of this aromatic herb. A hydrosol is the product of the gentle distillation of aromatic plants in water using a copper alembic pot still. The heat of the water softens the cells, releasing the constituents of the plant into the water. The parts that are water soluble and the highly volatile micro molecules of essential oils are caught in the vapour. The hot steam rises and all matter drops out as it spirals in the minaret dome of the still. It travels along a pipe to a coil in a condenser bucket that has cold running water flowing through it where it cools and becomes a liquid again. Hydrosols contain all the therapeutic qualities of both the plant itself through its water-soluble properties and the therapeutic properties of the essential oils which are present in the hydrosol in tiny micro-drops. They can be absorbed by the skin, in the gut or through mucous membranes. Hydrosols are easy to make and can be used in a variety of ways. Most are also appropriate for everyone, including the highly sensitive, elderly and the young. • In the home as a cleaning aid, or bug repellent, room freshener or linen spray. 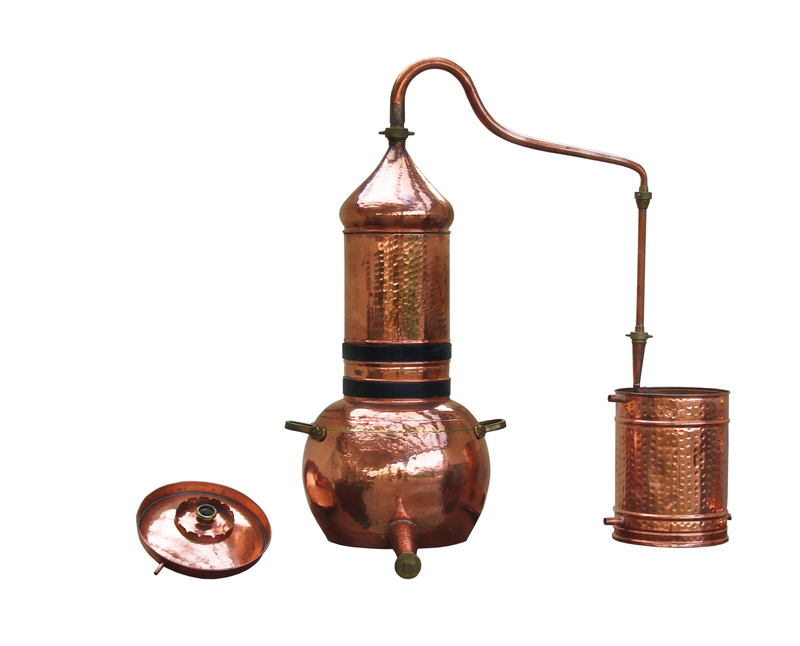 A copper alembic still used for distillation. Plants or flowers are put into boiling water or subjected to steam or both inside a still. If the plant is in boiling water only, it’s called a hydro-distillation. If the plant is steamed and is above or separate from the water it’s a steam distillation. I use a rosemary hydrosol daily. After showering I spritz my hair, face and underarms, and my teeth are cleaned with a quick spray in the mouth. I only ever use it as part of my morning routine, what I call “daily self-care and maintenance”. Why does this work for me? 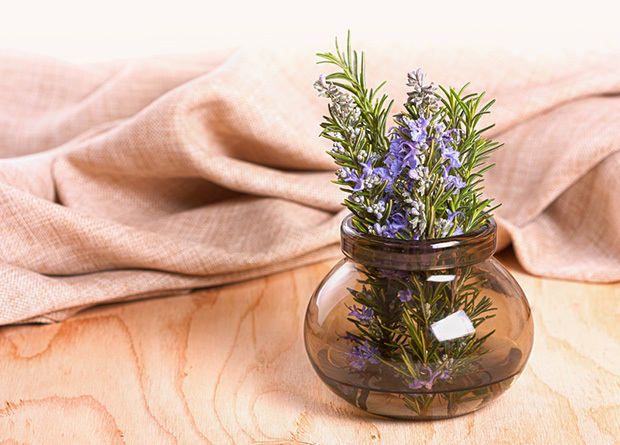 Rosemary is considered to be an anti-oxidant and a circulatory stimulant. It promotes healthy shiny hair, tones normal to oily skin, helps relieve chest tightness and congestion, eases muscular pain, is a mild diuretic, stimulates digestion, and has a tonic effect on the nervous system. I also mist it over a leg of lamb before it arrives at the table or add it to a herb risotto at the last minute. There is a neglected uncultivated hedge of rosemary that grows vigorously on a steep northern-facing rocky hillside looking out to sea near our house. It is swept by the prevailing salty wind and receives the full arc of the sun. It makes me think of the workers in Tunisia, lugging steel drums on their donkeys and backs, heading up the hillsides to harvest rosemary and then carrying it home to distil it in barrels over open fires. Thankfully for me it’s just a short stroll up the hill to harvest it, giving thanks and blessings to the rosemary, then a quick walk home to set up my still. 1. Fill the pot with water to the two-thirds mark and set to boil. While I wait for the water to boil I strip the leaves off the stems and discard any damaged or woody parts of the plant so I’m left with a fragrant pile of flowers and fresh sticky leaves. The twigs are set aside to dry as we use them as skewers for kebabs or throw them in the pizza oven for extra aroma. While they are still pliable I also plait some for smudge sticks which are great air fresheners.2. When the water is boiling I carefully remove the onion dome (copper gets hot so use oven mitts or a dry towel) and place five good handfuls (approximately 100g each) in the bowl so I have about 500g in total sitting in approximately 7 litres of water at a rolling boil.3. I place the onion dome on the pot and quickly seal the joins with rye flour paste. You want to prevent any of the steam from escaping as it has the bulk of the volatile essential oils, especially the first flush. 4. In moments the hot water will soften and burst the cells of the rosemary leaves and flowers, releasing the volatile essential oils and water soluble constituents. Steam will fill the onion dome and spirals, and any particles and dust will drop back into the water. The steam travels quickly along the copper pipes to the condenser bucket. 5. The condenser bucket must have cool running water flowing through it during the entire process. This is to cool the coil so the steam condenses to become a hydrosol. If the hydrosol feels warm, the coil is too hot – increase the flow of water. We are on tank water so I use an outdoor shower unit which runs off a 12 volt battery. It sits in a large bin of cold water and recirculates it so I’m not wasting anything. I have a hose attached to the outlet to drain the water back into the bin, but you could use a hose trickling into the bin if you have a good water supply. 6. The hydrosol soon trickles out into the beaker. When I have collected 100ml I take a pH reading. A good hydrosol has flavour, aroma and a pH between 4.5-5.5. From 500g of rosemary I only expect 500ml of hydrosol so I check the pH of the distillation every 100ml – as soon as it starts rising above the initial reading, I know I am getting mostly water. 7. I also check the flavour and aroma throughout the distillation. Less is mostly better than more. In an autumn distillation it should have a strong, grassy, green, herby flavour of rosemary and be pleasant to taste. When I distil rosemary at the height of summer – before it flowers – the aroma is predominantly of camphor and quite unpleasant to taste. If the aroma is sweet, grassy and agreeable, it suggests it will be great in skin and hair care, and for internal use. If the camphor smell is predominating it’s still a useful decongestant and antiseptic, or a cooling skin tonic on hot days. 8. The hydrosol is poured into an oil separator flask. You’ll find there is a little oil and it’s hardly worth separating so I often leave it in the hydrosol. The water acts as a sponge, absorbing a finite amount of the volatile essential oil. What it can’t absorb and keep in solution is released as millions of tiny bubbles which you will see spiralling to the surface. This is the essential oil being released – the specific gravity of the essential oil is lighter than water so it floats to the top.